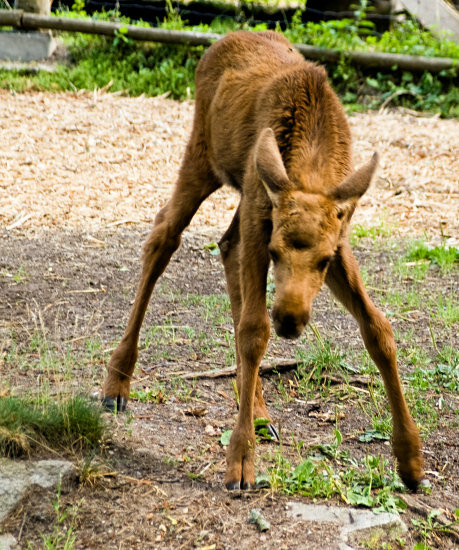 Um… this is actually a baby Moose, not an elk. 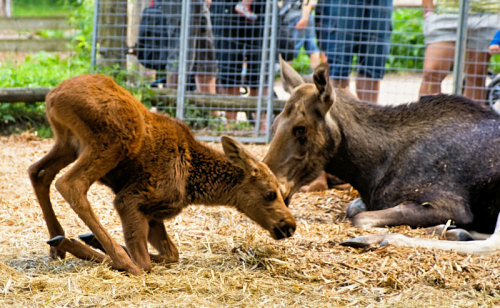 actually, here’s what Wikipedia has to say on elk and moose: “The animal bearing the scientific name Alces alces is known in Europe as elk and in North America as moose. The name elk is connected with several earlier European variants�Latin: alces, Old Norse: elgr, Scandinavian: elg, and German: Elch�all of which refer to this animal. I saw this animal in Sweden, where it was labelled as “elk”, which, incidentally is quite similar to the German name “Elch”. I just returned from Norway, where I had the opportunity to discuss with several people about a misconception that we have in the United States. One of the ranchers who is also a hunter, explain to me about and elg. I thought that he meant elk. But he immediately corrected me and showed me a set of horns of an elg. I said that they look more like Moose horns, and he again corrected me and specifically said they were not from the Moose. And elg definitely does not look like an elk. It does look more like a Moose, however there are some distinct differences. We were able to see a mounted elg head and it was different from the Moose. While driving through the forest we saw two elg . At first I thought they were Moose, however they were definitely different from any of the many Moose that I have seen. Both of the Norwegian people that I talk to said that they are definitely not an elk and they are definitely different from a Moose and in Norway they call them elg . They do also have a lot of Moose in Norway.